Jamaican soldiers. U.S. Navy photo by Mass Communication Specialist 2nd Class Kim Williams, Wikipedia Commons. 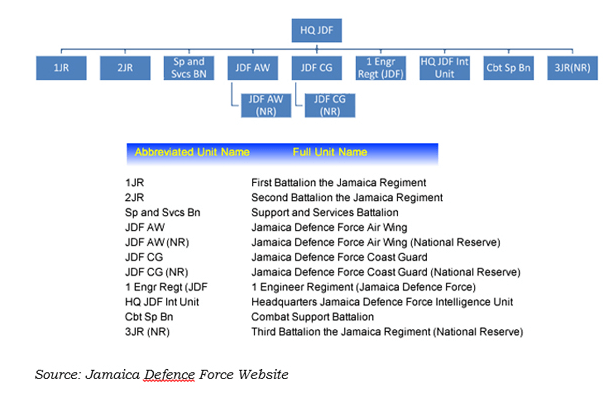 The Jamaica Defence Force is a brigade-sized unit comprising land, sea and air formations and is possibly the largest military establishment within the English-speaking Caribbean. Dating back to 1962, the Jamaica Defence Force (JDF) had its roots in the West India Regiment which lasted between 1795 and 1926 and thereafter as the military force of the West Indies Federation which existed between 1958 and 1962. The JDF was formed out of the 1st Battalion of the West India Regiment and was later supplemented by small air and naval components. The JDF enjoys a good reputation within the West Indies, having a high standard of training and discipline and, compared to the military establishments in other West Indian islands, has maintained an organisational stability that has stood it in good stead over the last five decades. The JDF has primarily been used to reinforce the Jamaica Constabulary Force (JCF), which is the island’s police force, in internal security operations which have been known to degenerate into pitched battles against well-armed criminal gangs. One of the more recent, and certainly most notorious incidents being the 2010 operations against the “Shower Posse” drug gang in an attempt to arrest its leader Christopher “Dudus” Coke. These operations saw the JDF and JCF engaged in urban combat with some 500 armed gang members in which 4 security personnel and 73 civilians lost their lives. The JDF deployed Armoured Personnel Carriers (APCs) and helicopters in support of its operations while the JCF employed weapons up to and including anti-materiel rifles to neutralize gang gun positions. The JDF was also deployed in support of the JCF in 1999 and 2001 to deal with extensive unrest sparked through an explosive combination of economic hardship, violent political agitation, and well-armed criminal gangs. Beyond its internal security role, the JDF saw service in Grenada between 1983 and 1985 in the aftermath of Operation Urgent Fury as part of the Caribbean Peace Force – along with forces from Barbados and police special service units from the Organisation of Eastern Caribbean States. It has also served in Haiti as part of a joint CARICOM Battalion. The JDF maintains very close ties with the British military and joint exercises are a routine occurrence which has served to preserve a high degree of professionalism in the JDF and its officers are held in high esteem within the Caribbean. Despite its undoubted professionalism, the JDF suffers from the bane of all military establishments in the English-speaking Caribbean – poor maintenance. Inadequate maintenance and a failure to procure spares in a timely manner has resulted in the demise of the JDF’s Ferret Scout Cars (which now serve as gate guardians), the Air Wing’s AS.355, Bell 212 and UH-1 helicopters as well as its Beech King Air and Cessna 210 aircraft, with its 2 BN-2A Islanders being barely operable. The Jamaica Coast Guard barely puts to sea and while it nominally has 6 patrol boats on strength, is practically without operational assets. Of great concern to the JDF was its inability to keep its ageing force of 14 V-150 APCs serviceable. Given the fact that these vehicles have proven invaluable in protecting JDF personnel during urban operations, their replacement became of great concern. Similarly, the Coast Guard urgently needed to restore capability. To this end a limited reequipment program for the JDF has started. Close on the heels of the procurement of new helicopters and cost-effective fixed-wing aircraft, the Jamaica Regiment began making strenuous efforts to replace its ageing V-150 APCs. Of the 14 originally procured, only 3 remained serviceable by 2009 and, considering their utility during periods of civil unrest, the need for replacement became acute. Eventually, the JDF decided on the procurement of 12 Bushmaster Protected Mobility Vehicles from Thales Australia with the contract being signed in December 2013. Deliveries commenced in 2015 and by January 2016, the full complement of 12 vehicles was received and entered operational service. A less glamourous but more important modernisation program was undertaken with infantry equipment as L1A1 SLRs, and British pattern web-gear and helmets were replaced with US-made M-16 rifles, M249 light machine guns and US pattern helmets and woodland camouflage and web-gear. However, because the JDF failed to procure spares beyond the warranty period, compounded by the country’s poor economic condition, the fleet again fell into disrepair. The HMJS Fort Charles was decommissioned in 2012 and the other vessels were almost completely unserviceable. In 2015, however, Jamaica concluded a peculiar deal with Damen whereby its three Damen SPa 4207s would be decommissioned and returned to Damen in exchange for 2 new SPa 4207s that Damen had in stock. The decommissioning and return of the JDF vessels took place on 8th November 2016 and it is intended, after refurbishment, to offer them for resale. The two replacement vessels to be named (after their predecessors) HMJS Cornwall and HMJS Middlesex are currently undergoing modification and outfitting prior to delivery to the JDF. It should be noted that these vessels have an austere equipment suite and lack advanced surveillance systems or weapons larger than machine guns. However, the SPa 4207 is a cost-effective solution to Jamaica’s maritime patrol needs and, like many other countries in the Western Hemisphere, Jamaica has decided to continue using the type. Once delivered, the Jamaican Coast Guard will be able to monitor the country’s maritime domain. Compared to the defence forces of Trinidad and Tobago, and the Commonwealth of the Bahamas, the JDF confronts similar security threats in the maritime sphere and from narcotics trafficking. Like Trinidad, it also faces a difficult internal security environment with its forces being deployed to augment a beleaguered police force against well-armed organized gangs. However, the JDF faces these challenges with the additional constraint of having to rely on a weak Jamaican economy to support its requirements. To the credit of the JDF and Jamaica, decisions have been made and resources allocated to keep the force viable in the years to come. Nonetheless, this viability will be contingent on adequate budgetary support being made available for the maintenance and upkeep of JDF assets and it remains to be seen if this will be forthcoming in the future. The Institute for Defence Studies and Analyses (IDSA) is a non-partisan, autonomous body dedicated to objective research and policy relevant studies on all aspects of defence and security. Its mission is to promote national and international security through the generation and dissemination of knowledge on defence and security-related issues. IDSA has been consistently ranked over the last few years as one of the top think tanks in Asia.